This should make these easier for everyone to find and install! Have fun! PopPet is a robot kit developed by Jaidyn Edwards. In collaboration with Jaidyn, I’ve been working on an app for use with PopPet. This app was designed for use with PopPet 2.0, but I’ve been testing it with my modded Kickstarter PopPet. I can solder… and I do solder when I need to… However, I’m not the most confident/skilled at it… So, in a lot of my projects, I setup the electronics entirely on a breadboard. 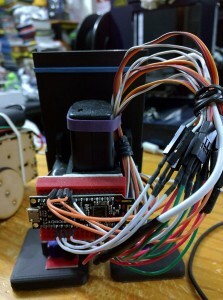 See this picture of my original MobBob built… all electronic done on a tiny breadboard. However, using a breadboard is not just for the solder-phobic! It can be a useful technique for building robots, so I wanted to share some of the tricks I use for doing robot electronics on a breadboard! The design has been refined to make him walk better, and to make him easier for others to build and recreate. After getting inspired by the amazing single-servo walking and rolling robots built by erco at www.robotrebels.org, I decided to have a go at designing my own version of the single-servo walker. Check out my friend fhareide’s awesome build of the Sphero Strandbeest.